Buying a new home is a dream of many. Therefore, once you get the keys, you start planning for its decoration that invariably includes buying all those electrical appliances, without which you cannot sustain freely. Investing in electronic products thus demands a deeper introspection, so that you can avoid any gaffes. Hence, if you have finally made up your mind to get some gadgets for your home, take this blog as your shopping directive. Doing a little homework before making the final payment might sound uninteresting but it is absolutely worth it. This actually gives you the much-needed time to decide on the brand, features and price. Suppose you want a microwave but you have a separate grill machine at your home, then choosing the high priced one with grill and convection features will not be laudable. Hundreds of e-commerce sites come up with tempting offers to lure their prospective customers. Nevertheless, neither all are valid nor are they reasonable. So to be conscious about your purchase is a mandate for any buyer, otherwise, you might end up regretting later on. People previously used to trust local stores more for buying electronic appliances, but slowly as the hope on the online shopping concept increased, the preference shifted. The budge of this trust from local dealers to online retailers is primarily backed by the price factor. On online e-commerce sites, we get that extra discount which local shops fail to provide. In addition to this, the free installation offer and other schemes also tempt the buyers. Online shopping in a way provides umpteen options to the clients in all categories. 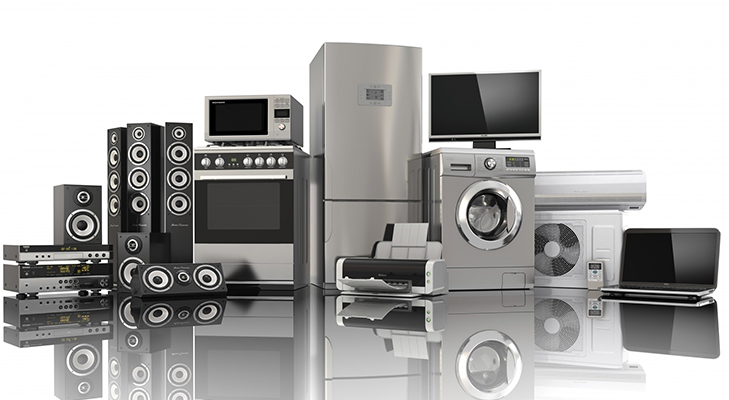 Moreover, the no-cost EMI format has allowed the middle-class families to fulfil their dream of purchasing costly appliances like AC, fridge, etc. with no trouble. Once you are done shopping, you immediately have to start worrying about the electricity bill. So it is better to invest in the power efficient alternatives. Even though they initially cost you a few more bucks, but later you do not have to fret about your electric bills. Therefore, without any doubt go for the energy efficient choices. This factor is especially applicable in case of gadgets like AC and refrigerators. Through our purchase of any electrical appliance, we seek to purchase comfort. Hence, settle your buy, keeping that convenience factor in your mind. Like if you want to buy a washing machine, then see whether you need a front load or a top load version, as per the effortlessness of using the same. In case of refrigerators also for large families go for the double door ones, while for smaller families the single doors suffice. We hope now you know how to shop for the electronic domestic device without difficulty.